As destinations throughout the UK develop, so too do the number of properties being designed and built. The northern city of Manchester is currently experiencing a boom, in terms of its economy and its popularity with people looking for home there. It’s due to this boom that there are plenty of houses being built throughout the city and its suburbs, particularly high rise apartments. 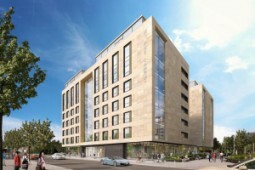 These brand new developments offer up the chance to sneak in and grab an off plan property in Manchester city centre. We’ve got some fantastic off plan properties on offer through our website. Browse our listings to see some of the latest Manchester development projects and what could be the perfect investment for you. Although buying off plan is quite new to the UK, it seems that the concept has taken the country by storm, particularly in major cities such as Manchester. Due to the city rising in popularity, it’s not surprising just how quickly property in Manchester is snapped up. In fact, there are cases where you might not even see a property in the listings before an offer is made! As such, it’s crucial to keep up to date with any off plan developments in process, to get ahead of the crowd and buy the property of your dreams in Manchester. Luckily for you, the team here at Property UK are professionals at discovering any upcoming real estate in Manchester, to offer to our lovely clients. So sit back, relax, and let us bring the latest off plan properties in Manchester to you. Why should you purchase a property off plan? It’s understandable that you might have some concerns when it comes to buying a property off plan, however the positives definitely outweigh the negatives. Firstly, whilst you’re purchasing a property that hasn’t yet been built, they are usually offered at a lower price than the same property will be once it’s completed. That way, you are saving yourself some money from the moment you purchase the property! Not only that, but you can simply resell the property once it’s been completed, earning yourself a quick and impressive profit! Buying off plan also gives you plenty of time to prepare yourself to either move in, or to have everything ready for leasing the property to a tenant. Finally, if you’re not 100% with the property in terms of its planned layout, colour schemes or interiors, for example, you may be able to speak to the developers, to discuss changes you would like making to the plan before purchasing.